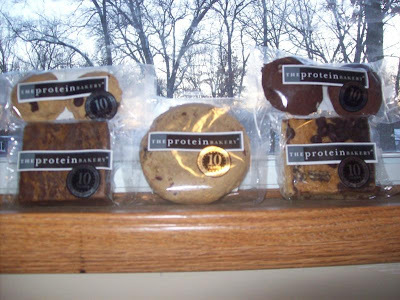 The Protein Bakery is a company that makes high protein baked goods. I really like this concept because you are having a dessert that will actually keep you full. These products are rich in whey protein, are wheat free, all natural, and have higher dietary fiber than many baked goods. My favorite from what I have tried so far is the Blondie with Chocolate Chips. I would only eat about half of it at a time though because for 1 bar it contains 380 calories! It also contains 11 grams of protein, 10% of your daily calcium, and some Vitamin A and iron. The dessert is chewy and tasty. I am impressed and cannot wait to try the rest of the yummy desserts that I was sent. 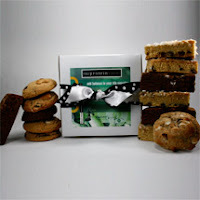 The giveaway will be for the Sample Gift Box which contains four cookies and four brownies/blondies (a $28.25 value). The giveaway is open until Midnight on Tuesday March 1st. Winner will be chosen on Wednesday March 2nd using Random.org. Visit The Protein Bakery website and let me know what you would most like to try. luv to try their chocolate chocolate white cookies the most. entered your Naumes Fruit gift set giveaway. OH MY GOSH! Thank you for letting me know about this bakery.. I am a protein fiend! I would most like to try the blondie assortment. WOW. I would love to try the Brownie with Chips! posted about it, liked your page! Great site! and I LOOOOVE the wicked mint brownies!! I would love to try their oatmeal chocolate chip cookie. But, they all look amazing! I would love to try the peanut butter blondie!! Peanut Butter Blondie sounds delicious! I would lov ehte cookie assortment in a silver pint tin. I also entered the Naumes Fruit giveaway. I also entered the Obol giveaway. id love to try the mint brownies!! I'd love the espresso brownie with chocolate chips! Entered all your current giveaways, thank you! I would like the blondie Assortment Gift Bag. I would like to try the Chocolate Chocolate White Chocolate Chip Cookies!